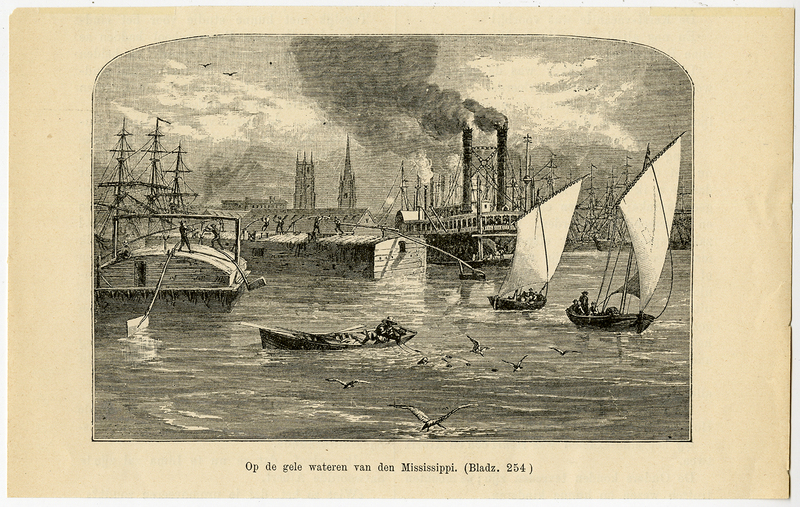 Subject: Antique print, titled: 'Op de gele wateren van den Mississippi.' - On the yellow waters of the Mississippi. Condition: Very good, given age. Small fainted fold in the right side of the margin. Small paper damage in the left upper corner of the margin. Image fine. General age-related toning and/or occasional minor defects from handling. Please study scan carefully. Medium: Wood engraving on wove paper. Size (in cm): The overall size is ca. 17.9 x 11.2 cm. The image size is ca. 13.7 x 9.3 cm. Size (in inch): The overall size is ca. 7 x 4.4 inch. The image size is ca. 5.4 x 3.7 inch.